This Review was commissioned by International Record Review - I hope reprinting it here will broaden interest in this very fine composer. 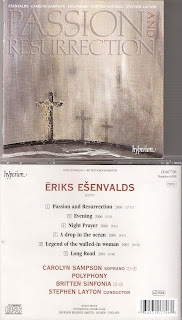 Within seconds I knew I was going to adore this CD and the music of Ēriks Ešenvalds. Assuming him to be a new musical voice on the choral circuit, I delved into his website and discovered that no less than 16 CDs have so far been released featuring his music. I'm amazed that none of these has permeated my consciousness yet, for if what they contain is half as good as what's here, they should be heading high up into the popularity stakes at a time when atmospheric music with a strong spiritual/mystical flavour is all the rage. Apologies, then, if in my musical isolation I've been missing out on what everyone else is talking about, but for the benefit of those who, like me, have somehow been bypassed by this 30-something-year-old, former Baptist seminarian whose composition teachers range from Jonathan Harvey and Michael Finnissy to Richard Danielpour and Klaus Huber (and his website lists no less than a dozen more), here's a potted biography. Born in Priekule, Latvia, he studied at the Latvian Academy of Music in Riga and then appeared to go on some kind of European walkabout picking up along the way innumerable diverse musical influences (allowing him, in the words of Gabriel Jackson's booklet note, to "develop a flexible musical language" – a minor understatement, if ever there was one). He then chose to enter the church. Two years at a seminary persuaded him to devote his life to music, but he currently retains his connection with the church by serving as Director of Music for a Baptist congregation in Riga. His output to date lists 57 compositions – not a bad tally considering the earliest is dated 1998 – which, while including theatre pieces, electronic music, solo instrumental, chamber and orchestral works, are dominated by vocal and choral pieces. 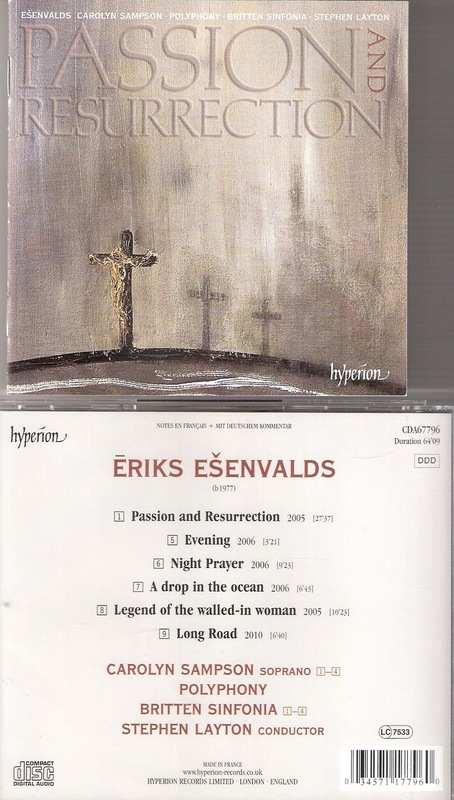 And it is that area of his output to which this recording - the first CD to be released internationally devoted entirely to Ešenvalds's music – is devoted, comprising five a-capella pieces and the 30-minute oratorio for soprano, chorus and orchestra, Passion and Resurrection. The music encompasses an extraordinary range of styles. Long Road, the most recent piece here (dating from 2010) opens as if it were a simple 19th century hymn before unravelling itself into a wash of gently swaying sound complemented by a few distant tinkling bells and, apparently, some ocarinas, while Gabriel Jackson's notes point to Ešenvalds's use of "avant-garde techniques" in the 2006 A Drop in the Ocean. These, though, seem confined to some vague whistling from the choir who also indulge in a bit of whispering and heavy breathing. Stylistically varied it may be, but everything here has in common a wonderful sincerity of expression and a shimmering sense of colour which I find quite irresistible. The major work here is the four-movement Passion and Resurrection. Recorded immediately after these same forces had presented the work in concert in Trinity College Chapel, Cambridge, last April, this is a performance of considerable impact, not least in the second movement when the electrifying choral cries of "Crucify" dissolve so magically into calm, plainchant-inspired music above which Carolyn Sampson floats with angelic luminosity. Cast in the role of Mary Magdalene, she manages to combine pathos, sympathy and real drama, helped along by highly evocative string playing from the Britten Sinfonia and, of course, the unfailingly remarkable choral sound of Polyphony. If the music wasn't so utterly gorgeous, I would happily devote several hundred words to praising Stephen Layton on these totally absorbing performances. But, along with Polyphony, he set the benchmark long ago and while this is as good as anything they've ever committed to disc, the real praise here has to be reserved for Ēriks Ešenvalds whose music clearly warrants a great deal more exposure.